In 2016, the Government of Israel set new goals to strengthen economic ties with African countries. Israel, like other global players, is interested in building economic bridges to the growing markets in Africa. This paper examines the current state of Israeli exports to developing markets. It then reviews the tools currently employed by the Government of Israel to aid Israeli exporters and compares them to the methods used in other developed countries. 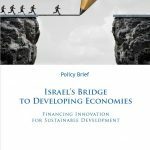 The paper suggests that Israel establish a Development Finance Institute to increase Israeli exports to Africa and other developing markets. The paper concludes with a model of how such an institute may work. How to Turn the Start-up Region into the Start-up Nation?